Fanny is a Postdoctoral Research Fellow in the Marshall Lab at the Queensland Brain Institute, The University of Queensland. Fanny is originally from France where she completed her Bachelor and Master of Science. Since the completion of her PhD in December 2013 at the University of Western Australia, Fanny has held two postdoctoral research positions, one year at King Abdullah University of Science and Technology (Saudi Arabia) and her current position in the Marshall Lab. 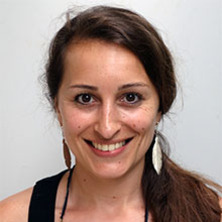 Fanny has eleven years expertise in deep-sea ecology/biology, seven years expertise in neurobiology and has worked and acquired her research experience in five different internationally renowned research laboratories from four countries: National Oceanography Centre (UK), Ifremer (France), The University of Western Australia, King Abdullah University of Science and Technology (Saudi Arabia), and The University of Queensland (Australia). Fanny's research interests lay in visual ecology, sensory systems, marine biology and deep-sea ecology/biology/diversity and aim to better understand fish visual adaptations in relation to their environment and evolutionary history. She is particularly fascinated by the deep-sea environment and how its inhabitants have adapted to see in dim light conditions and for viewing bioluminescence. During her PhD, Fanny studied in detail the visual system of one of the most abundant deep-sea fish family in the world ocean, the lanternfishes (Myctophidae). This work led to the discovery of novel visual specialisations for vision in dim conditions and for viewing bioluminescence, and shed some lights on lanternfish behaviour. In addition to continuing her investigation of the visual system of deep-sea fishes, Fanny's current work in the Marshall’s lab, includes coral reef fishes. She is particularly interested in the visual system of the holocentrids (squirrelfish and soldierfish), a family of conspicuous nocturnal reef fishes that seem to have migrated back to the shallows from the deep-sea and may provide another piece of the puzzle to better understand the evolution of dim-light vision. Did colour vision evolve in the dark? How do manta and mobula rays see their world? Note for students: Dr Fanny De Busserolles is not currently available to take on new students.